Situated by the ocean, this resort is 0.2 mi (0.3 km) from Green Island Jetty. If you're looking for a great (and cheap!) hotel in Cairns and Northern Beaches, CheapTickets is the best place to find them. 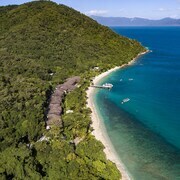 We offer deals on the best 315 hotels throughout Cairns and Northern Beaches. No matter what you're looking for, we have options for you. Grab great rates on the 112 affordable 3-star hotels that are easy on the wallet without sacrificing comfort. Looking for more luxury? Try one of the 127, 4-star hotel accommodations in Cairns and Northern Beaches. No matter your budget needs, we've pulled out all the stops to make sure you have plenty of vacation options. Maybe you prefer to search for your hotel deals based on what each hotel offers? For example, let's say you just want to find a hotel or resort that has a pool to cool off in after a long day exploring Cairns and Northern Beaches. 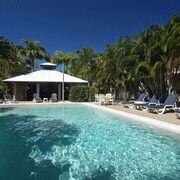 Scroll down to choose from the 141 hotels in Cairns and Northern Beaches that has a pool for guests. 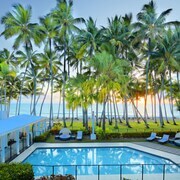 Or search for deals on Cairns and Northern Beaches hotels offering free wifi or breakfast, non-smoking rooms, and more! 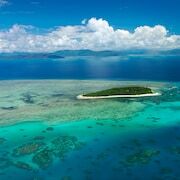 CheapTickets is here to be your personal travel agent for your next trip to Cairns and Northern Beaches. Get booking today! What hotels in Cairns and Northern Beaches offer free wifi access? Are there deals on Cairns and Northern Beaches hotels offering free breakfast? Yes! The only thing better than finding a great deal on a cheap hotel in Cairns and Northern Beaches is finding one that offers free breakfast. Grab some eggs, a waffle, or some healthy oatmeal before a day full of exploring Cairns and Northern Beaches and all that it has to offer. Below are just some of the many hotels that offer free breakfast in Cairns and Northern Beaches. 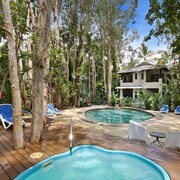 Reef Encounter is a 4.00 star rated hotel property in Cairns and Northern Beaches that offers free breakfast. What about deals on pet-friendly hotels in Cairns and Northern Beaches? Cairns and Northern Beaches is a great place to get outside and explore with your pets in tow so don't leave your furry friends behind. Below you'll find great deals on hotels in Cairns and Northern Beaches that allow pets. Don't forget to bring plenty of treats! 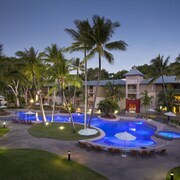 Palm Royale Cairns is a popular, pet-friendly, 4.00 star hotel in Cairns and Northern Beaches. 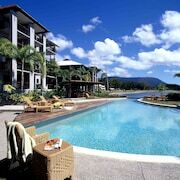 Cascade Gardens is a popular, pet-friendly, 3.50 star hotel in Cairns and Northern Beaches. 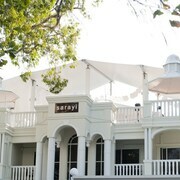 Any good rates on Cairns and Northern Beaches hotels with restaurants? Absolutely. Don't want to deal with planning our all your meals on your trip to Cairns and Northern Beaches? We don't blame you. Keep the hangry away by staying in one of the 56 hotels that have restaurants. With a room at one of these spots, all it takes to get a good meal is hopping in the elevator. Check out some of the most popular hotels in Cairns and Northern Beaches that have restaurants below. Book Cairns Plaza HotelCairns Plaza Hotel is a 3.50 star hotel and has one or more restaurant options. Book DoubleTree by Hilton Hotel CairnsDoubleTree by Hilton Hotel Cairns is a 4.50 star hotel and has one or more restaurant options. Book Bay Village Tropical Retreat & ApartmentsBay Village Tropical Retreat & Apartments is a 3.50 star hotel and has one or more restaurant options. Book Cairns Queenslander Hotel & ApartmentsCairns Queenslander Hotel & Apartments is a 3.50 star hotel and has one or more restaurant options. What are the cheapest hotels in Cairns and Northern Beaches with pools? What's better after a long day exploring Cairns and Northern Beaches then a relaxing dip in a pool? Finding the Cairns and Northern Beaches hotel you need for a bargain! Cool off and unwind at one of our 141 Cairns and Northern Beaches hotels with a pool. Browse some of the top deals on these hotels and resorts with pools in Cairns and Northern Beaches below, but be warned: You may not want to check out! ibis Styles Cairns has a pool and a 3.50 star rating. Castaways has a pool and a 3.50 star rating. Vue Apartments Trinity Beach has a pool and a 4.50 star rating. Citysider Cairns has a pool and a 3.50 star rating. What hotels in Cairns and Northern Beaches offer parking for guests? Once you've made your way to Cairns and Northern Beaches, the last thing you want to deal with is finding parking close to your hotel. Avoid the hassle of parking around the block and carrying your luggage all the way to the lobby by booking one of our hotels with parking. Check out deals on some of the 127 hotels in Cairns and Northern Beaches that offer parking for guests. Cairns Sheridan Hotel This hotel has a 4.00-star rating. The Sebel Palm Cove Coral Coast This hotel has a 4.00-star rating. Gilligan's Backpackers Hotel & Resort This hotel has a 2.00-star rating. Piermonde Apartments - Cairns This hotel has a 4.00-star rating. Do Cairns and Northern Beaches hotels offer 24-hour concierge services? When you're on vacation, things don't always go according to plan. Travel with peace of mind when you book one of our 24 hotels in Cairns and Northern Beaches with 24-hour concierge service. That way you know help is always phone call or elevator ride away. 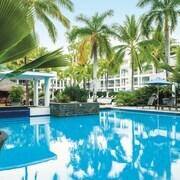 Try Novotel Cairns Oasis Resort. It's a 4.50 star rated hotel in Cairns and Northern Beaches that offers concierge services 24 hours a day. 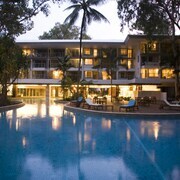 Try Kewarra Beach Resort & Spa. It's a 4.00 star rated hotel in Cairns and Northern Beaches that offers concierge services 24 hours a day. Try The Abbott Boutique Hotel. It's a 4.00 star rated hotel in Cairns and Northern Beaches that offers concierge services 24 hours a day. Try The Hotel Cairns. It's a 4.00 star rated hotel in Cairns and Northern Beaches that offers concierge services 24 hours a day. What about low rates on non-smoking hotels in Cairns and Northern Beaches? Imagine Drift Palm Cove This hotel has a 4.00-star rating. Aspect Central This hotel has a 3.00-star rating. Park Regis City Quays This hotel has a 4.00-star rating. BreakFree Royal Harbour This hotel has a 4.00-star rating. What are the cheapest Cairns and Northern Beaches 3-star hotel deals? Our 3-star hotels bring you quality accommodations at a lower price point for the perfect, budget-friendly vacation in Cairns and Northern Beaches. With 112 3-star hotels throughout Cairns and Northern Beaches to choose from, you still have options. Browse our selection below. Cairns Plaza Hotel. Situated in Cairns, this hotel is 0 mi (0.1 km) from Muddy's Playground and within 3 mi (5 km) of Centenary Lakes Botanic Gardens and Mount Whitfield Conservation Park. St Monica's Cathedral and Cairns Esplanade are also within 10 minutes. Citysider Cairns. Situated near the airport, this apartment is 0.5 mi (0.7 km) from Cairns Civic Theatre and within 3 mi (5 km) of Centenary Lakes Botanic Gardens and Mount Whitfield Conservation Park. St Monica's Cathedral and Cairns Base Hospital are also within 15 minutes. ibis Styles Cairns. Located in the heart of Cairns, this hotel is 0.1 mi (0.2 km) from Cairns Civic Theatre and within 3 mi (5 km) of Centenary Lakes Botanic Gardens and Mount Whitfield Conservation Park. Center of Contemporary Arts and Jute Theatre are also within 5 minutes. Aspect Central. Situated on the Strip, this motel is 0.5 mi (0.8 km) from Cairns Base Hospital and within 3 mi (5 km) of Centenary Lakes Botanic Gardens and Mount Whitfield Conservation Park. Cairns Esplanade Charles Street Parkland and Cairns Civic Theatre are also within 15 minutes. What are the best deals on 4-Star Hotels in Cairns and Northern Beaches? Cairns and Northern Beaches is full of hotels and it can be hard to narrow down where you really want to stay. Luckily, we've done that hard work for you be narrowing you from 315 hotels throughout Cairns and Northern Beaches, to the 127 4-star hotels in Cairns and Northern Beaches. Our 4-star hotels in Cairns and Northern Beaches are exactly what you need for your next family trip, romantic weekend, or solo getaway. Check out our most popular deals below. Mantra Esplanade: Located in Cairns CBD, this aparthotel is 0.1 mi (0.2 km) from Cairns Regional Gallery and 2.7 mi (4.3 km) from Centenary Lakes Botanic Gardens. Esplanade Lagoon and Cairns Night Markets are also within 5 minutes. Novotel Cairns Oasis Resort: This family-friendly Cairns hotel is located near the beach, steps from Jute Theatre, Center of Contemporary Arts, and Kick Contemporary Arts. Centenary Lakes Botanic Gardens and Mount Whitfield Conservation Park are also within 3 mi (5 km). DoubleTree by Hilton Hotel Cairns: Located in the heart of Cairns, this luxury hotel is 0.1 mi (0.1 km) from Cairns Esplanade and within 3 mi (5 km) of Centenary Lakes Botanic Gardens and Mount Whitfield Conservation Park. Center of Contemporary Arts and Jute Theatre are also within 5 minutes. Cairns City Palms: Located in Cairns CBD, this aparthotel is 0.1 mi (0.2 km) from Cairns Regional Gallery and 2.7 mi (4.3 km) from Centenary Lakes Botanic Gardens. Esplanade Lagoon and Cairns Night Markets are also within 5 minutes. What are the best activities to do in Cairns and Northern Beaches? Whitewater Rafting & Reef Snorkeling Combo: Starting at just $136 per person. Cairns Sunset Cruise: Starting at just $36 per person. Kuranda Train, Skyrail & Reef Snorkel Combo Tour: Starting at just $109 per person. Green Island Reef Cruise: Starting at just $46 per person. Nice location beautiful view fantastic layout and nice staff. Smoking accommodation on the deck of the room. lived in unit 5, and we can tell it used to be a luxury accommodation, But there are many defects that prove this property is overrated. 1.very weak and slow internet connection, and only have signal in lounge room 2.old and squeaking dining chairs 3.very dirty cushion and sofa 4.the general switch of electricity cooktop not working well 5.only 1/3 toilet roll left in ensuite on first day we moved in, and that's for 3 days' stay 6.being asked to empty all the bins in the room. Considering it's a luxury accommodation, the request is below average service level. 7.The ditch of front driveway ramp scratches sedan bottom protection metal. The hotel is WAY away from the town, and other than swim in the pool, there's NOTHING to do! The staff is very friendly and helpful, ESPECIALLY at Jake & Shannon's restaurant on the property. UNFORTUNATELY, during Jan., Feb, and March,...there are jellyfish in the water, some VERY small ones that can sting and u don't know it til your OUT of the water. PLUS,...there can be crocs in the water, not to mention sharks! Also,...there is NO SMOKING ANYWHERE on the property or in the open air restaurants. You must go across the street IF you want a cigarette. Rooms are comfortable, and FULLY equipped with all that is needed to cook and clean. PLUS, there is a washer and dryer in EACH room which makes having clean clothes very convenient! Great spot to see Barrier Reef and Cairns. Wonderful restaurants within walking distance.